Today’s near-zero rates are free money for investors, but murder for savers and retirees. No surprise, the Federal Reserve once again caved in to Wall Street pressure and decided to maintain its ridiculous zero-interest-rate policy, or ZIRP, for at least another three months. The Fed has deliberately kept short-term interest rates near zero for nearly seven years, as a way to try to stimulate the economy in the aftermath of the 2008 financial crisis. But apparently, even long access to nearly free money is not enough to get the economy back on track, although Wall Street has made billions of dollars in profits thanks to ZIRP. “Recent global economic and financial developments may restrain economic activity somewhat and are likely to put further downward pressure on inflation in the near-term,” the central bank said, in its typically opaque statement about the decision. The Fed will likely revisit the topic again in December, and the expectation now is that rates will be raised then, since a majority of Fed officials are set to support an increase. The last time the Fed raised rates was in 2006. 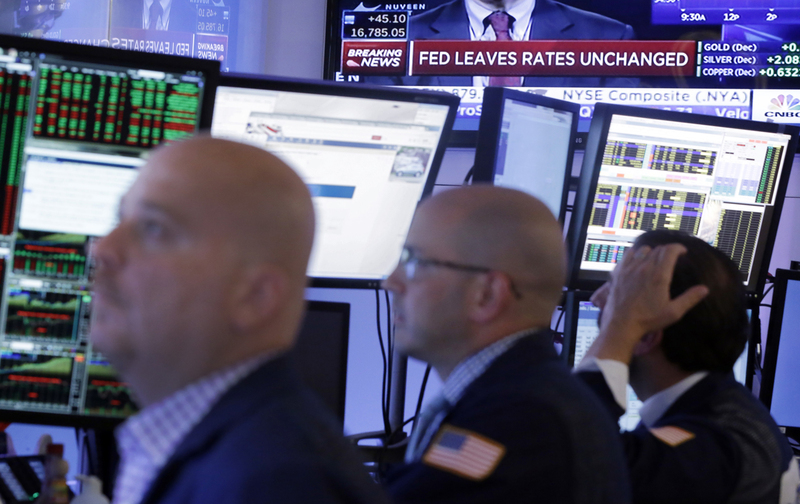 Why does Wall Street love low interest rates? It’s simple. For people who work on Wall Street or in its orbit—such as billionaire hedge-fund managers and billionaire private-equity moguls—money is the raw material they use to make more money, not unlike how General Motors uses glass, aluminum, leather, plastic, and rubber to make a car. Of course, General Motors must pay for these raw materials; it doesn’t get them for free. But thanks to the Fed’s ZIRP, Wall Street and its patrons get their raw material virtually for free, and have since 2008, when former Fed chairman Ben Bernanke announced his intention to keep short-term interest rates as close to zero as possible until unemployment, then around 10 percent, was lowered to 6.5 percent. (It’s worth noting, of course, that the unemployment rate is now 5.1 percent; the Fed has ignored its own targets for when it would raise rates.) No other industry on the face of the earth gets its raw material for free. Big Wall Street banks get their raw material (money) from places like the Fed by borrowing for a few days or so—and from the public markets by borrowing for a longer stretch—at very low cost. They also get it nearly free from you and from me. The hard-earned money that we put into our checking and savings accounts every day in banks all across the country is essentially a free loan to them. Have you looked at the interest-rate on your savings account lately? That’s the amount of money the banks pay you and me to have access to our money whenever they want it and for us to have access to it whenever we want it. My bank pays me 0.6 percent, or $6 of interest annually for each $1,000 on deposit. Banks then lend much of our money out to big corporations, to private-equity firms, to hedge funds—whoever is fortunate enough to meet their tough credit criteria—and then they mark up the price of that money to insure that they are making a big profit. For instance, JPMorgan Chase & Co., one of the nation’s biggest banks, has more than $2 trillion of our money on deposit, money that we have given it voluntarily. While JPMorgan Chase pays me $6 annually for every $1,000 I lend it, it is not unreasonable to expect that it collects around 7 percent in annual interest, and maybe more, or $70, on that same $1,000 when it lends it out—an annual pre-expense profit of $64 for the bank. People in private-equity or hedge funds who borrow money for a living could not be happier, since long-term interest rates are at historic lows. So Wall Street banks and their big clients love ZIRP and are making billions of dollars off of it. In 2014, JPMorgan Chase made a record pre-tax income of nearly $30 billion. The dirty little secret of the Federal Reserve is that it is owned and controlled by the big Wall Street banks. Who else likes ZIRP? Why, the biggest borrower on the planet, of course: the US federal government. The national debt currently stands at $18.8 trillion, or nearly $59,000 for every person in the country. ZIRP helps keep the annual interest payments on all of this debt much lower than it would otherwise be if ZIRP were to be abandoned. ZIRP, therefore, helps keep the federal government’s annual budget deficits lower than they would otherwise be too, making them less of a political hot potato, as they would surely be if interest rates were higher. Needless to say, there are powerful forces both on Wall Street and in Washington who like ZIRP very much. What about the American people? Shouldn’t we like low interest rates, too? In theory, yes. But in practice, the answer is no. For starters, the typical American borrower doesn’t see the low interest rates. The interest rates on credit cards—where most Americans borrow money—typically range from something like 13 percent to 15 percent annually, and can get much higher, to the range of 25 percent annually. That’s not low. Interest payments for car loans are lower, yes (in the 4-5 percent range), as are mortgages rates (3-4 percent), but good luck getting a car loan or a mortgage. Not that it’s impossible, but it’s certainly much harder today than it was before the financial crisis, when it seemed all you had to do was breathe to get a car loan or a mortgage. Nowadays, the credit pendulum has swung back, and only those with the best credit can get access to home mortgages or car loans. But most Americans aren’t in the market for car loans or home mortgages. Most Americans are savers, or are retirees on a fixed income, who are looking to take minimal risk with their hard-earned savings and get a decent return on them. That’s where the real pain of ZIRP comes in for the average American. As we have seen, banks pay near nothing for their savings and have been paying close to nothing for seven years. That hurts. Those savers or retirees who are tired of getting nothing on their money are then forced to take more risk in hopes of getting a higher return, and end up having to buy often volatile stocks or bonds or securities that are rated AAA but really aren’t. Sound familiar? That’s exactly what happened in the years leading up to the 2008 financial crisis, when Alan Greenspan’s Fed also lowered short-term interest rates to around 1 percent, from around 6 percent after September 11. Now, of course, with ZIRP, the Fed’s short-term overnight rate is even lower (0.25 percent) than it was before the 2008 crisis. Investors are once again taking much bigger risks with their money than they are getting rewarded for in the market, which is the same recipe that led to disaster seven years ago. The dirty little secret of the Federal Reserve is that it is owned and controlled by the big Wall Street banks and closely serves their interests. It is not, as is widely believed, an independent branch of the government or an agency that works to benefit the American people. The Fed’s cowardice on Thursday, its failure to do something to benefit savers and retirees after seven years of helping to making the rich richer, is about as much evidence as anyone needs as to where its loyalties really lie. Editor’s note: This piece originally stated that 0.6 percent of $1,000 was 60 cents, rather than $6. The text has been updated to correct the error. William D. CohanWilliam D. Cohan, a former senior Wall Street investment banker and a contributing editor at Vanity Fair, is the author of The Price of Silence: The Duke Lacrosse Scandal, the Power of the Elite, and the Corruption of Our Great Universities.